Wheel locks are easy to install and very effective as a theft deterrent. Simply replace one lug on each wheel for disc styles, and two for spoke. There are no moving parts to corrode or jam. Each lock has a specially coded pattern milled into it that engages with the corresponding pattern on the key/adapter tool. McGard offers a wide range of key patterns for added security and your fleet’s pattern will be registered with us to make ordering additional locks or keys quick & easy. All locks are made of high quality alloy steel and through-hardened for strength & durability. 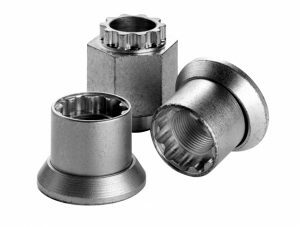 McGard wheel locks can be installed to the recommended torque for your lug nuts using an impact style or standard lug wrench. 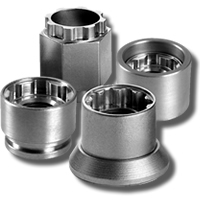 Your wheel locks are designed and manufactured for many years of trouble free protection – and peace of mind. Packaged sets for Owner/Operators. Additional locks & keys can be ordered to supplement either of these. 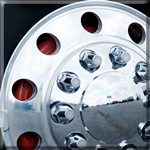 Metric disc locks are designed to replace one lug nut per outside wheel (2 per axle) on steering, drive and trailer axles. This lock matches the European style flange nut used on the 10 stud hub mounted disc wheels. Compatible with most standard lug nut caps. Thread: 22mm x 1.5. 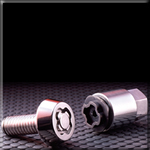 Key adapter tools are designed to be used with the above listed locks. One end of the key matches the key pattern in the wheel lock while the other end has a hex that will work with a variety of standard lug nut installation & removal tools. Fleets with locks keyed alike will have their lock pattern registered with McGard for future orders or replacement parts. Available for single tractors, single trailers or tractor & trailers in the following applications. Additional locks & keys can be purchased to supplement these sets. Wheel lock set for metric hub mounted disc wheels. Set includes 10 locks & 2 keys. Application–tandem axle tractor & tandem axle trailer. Thread: 22mm x 1.5. Wheel lock set for metric hub mounted disc wheels. Set includes 6 locks & 2 keys. 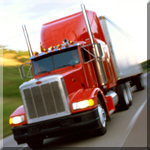 Application–tandem axle tractor or single axle tractor and single axle trailer. Thread: 22mm x 1.5. Heavy Duty Truck & Trailer Wheel Lock Set (M22 x 1.5 Thread Size) – Set of 10 Locks and 2 Keys. Heavy Duty Truck Wheel Lock Set (M22 x 1.5 Thread Size) – Set of 6 Locks and 1 Key. 2) How many axles do you wish to protect. You can purchase any quantity of locks, large or small, keyed alike for convenience. To order Truck Locks, or for more information, contact McGard: Email or Call 800-669-6887 and ask for Heavy Duty Truck Lock Sales. 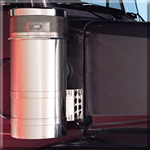 Contact your local Peterbilt/Paccar dealer for pricing and availability. 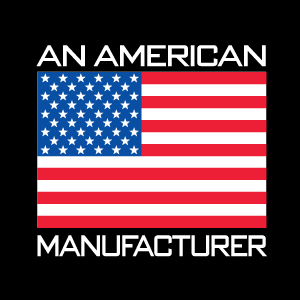 Paccar and Peterbilt are trademarks of Paccar, Inc. and its subsidiaries. Donaldson is a registered trademark of Donaldson Company, Inc. Vortox is a trademark of Vortox Company.